Bridget Kibbey on the harp. Chad Hoopes playing Saint Saens. Keep listening. The rewards are huge. Grace Park, Chap Hoopes, Matthew Lipman and Mihai Marica perform with Kibbey at The Angel's Share. Beguiling Debussy and rip-snorting Edgar Allen Poe. Andrew Ousley continues to present top musical talent in unusual but intriguing settings in Manhattan and Brooklyn. 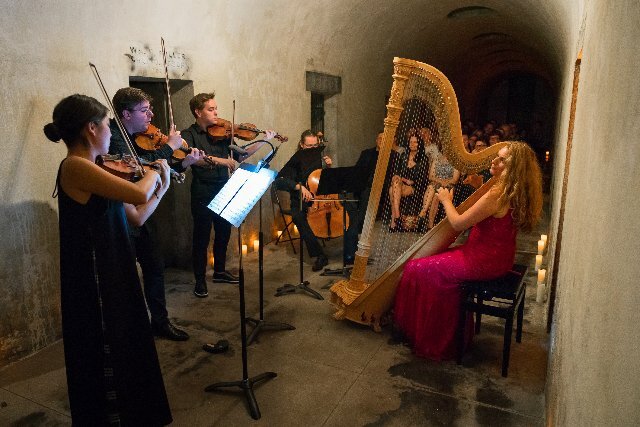 On a dark and stormy night, an audience of new music appreciators were captivated by the prospect of whiskey in a cemetery followed by a walk through beautiful grounds. 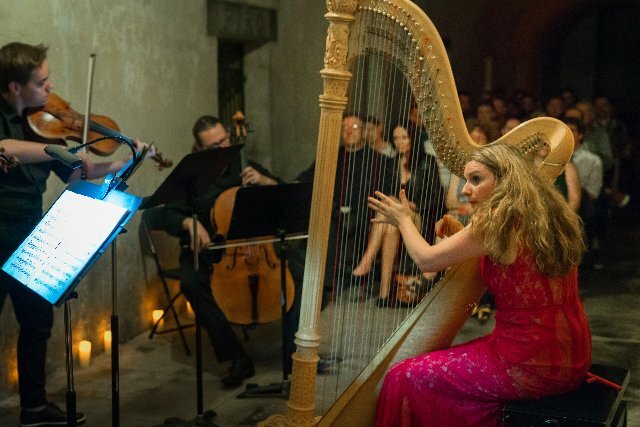 Then an ineffably beautiful concert by Bridget Kibbey and friends in the Catacombs of the land-marked Green-Wood Cemetery in Brooklyn. The audience was treated to another special evening, unexpected, thrilling and satisfying. This is what live classical music can be. Every venue across our land is looking for ways to attract new audiences. Ousley has come up with a persuasive answer. Talking to individual audience members, it is clear that most of them have not listened to much classical music. For many, this is the first classical concert they have ever attended. No question they are wowed. 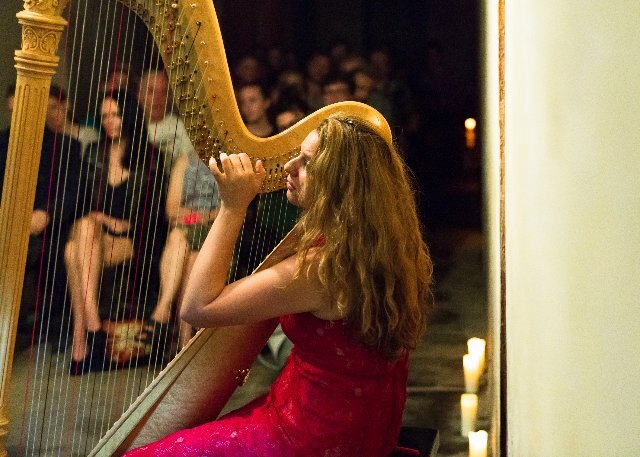 Bridget Kibbey is a harpist of international renown. Like many of the artists Unison Media presents, she is warm and communicative. After her introduction, she explains the works she is performing with her stellar collaborators, Chad Hoopes and Grace Park on violin, Matthew Lipman on viola and Mihai Marica on cello. Debussy’s Sacred and Profane Dances transports us for openers. It is a beguiling work, and seems as daring today as it was when it debuted. The first dance brings out primitive religious feelings, although the carefully constructed music of evocative rhythms and harmonies will appeal to any listening ear. Kibbey and her troops engage the audience immediately. The second dance is earthy and sensual. Throughout the evening, this almost sexual and certainly lifeful tone wafts through the spectral air. 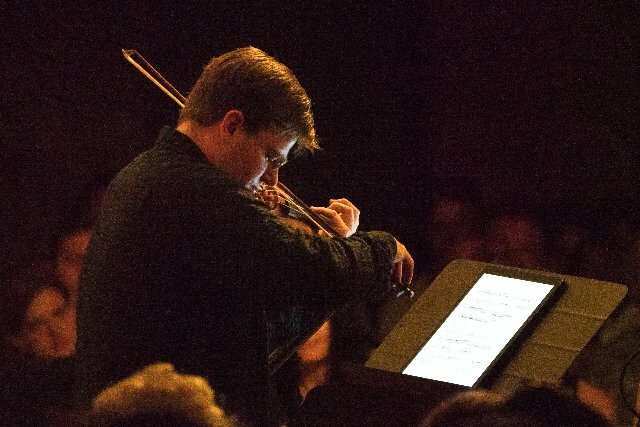 Saint Saens’ Fantaisie is a solo highlight, featuring Chad Hoopes on violin. His tones are perfectly conceived and unusual. Smooth lines flow, but their sounds come from profound depths as they strain to new heights. Saint Saens wrote this piece at the end of his life and like many composers, preferred the harp to the piano. It has a lighter, more ethereal tone. Listening to Kibbey, the harp converts listeners. Matthew Lipman on viola accompanied Kibbey in Benjamin Britten’s Lachrymae. In dialogue and duet the two performers captured an edgy but clear sadness and hope. Bach’s Toccata and Fugue in D Minor was transcribed for the harp. Film buffs instantly respond to the marvelous and familiar notes. It has been used in early horror films like Dr. Jekyll and Mr. Hyde and The Black Cat. Fellini put it in the score of La Dolce Vita and you can hear it yet again in the dystopian science fiction film Rollerball. Kibbey casts a new light, both horrific and magnificent. Her approach to her instrument is simply beautiful and incredibly complex, a stunning presentation. The finale brought all the instrumentalists together again. Now we find out why Kibbey is garbed in a full-length red dress. André Caplet, unjustly underrepresented in modern concert programming, did a score based on Edgar Allen Poe’s The Masque of the Red Death. It is an exciting drama that moves through seven rooms in an ancient abbey, until Prince Prospero has to confront a mysterious figure. All members of the chamber group add fury and fun to the telling. Yet it is Kibbey who treats us to all the possibilities of her harp, part piano, part orchestra, but in her hands, always an instrument of great mystery and beauty. 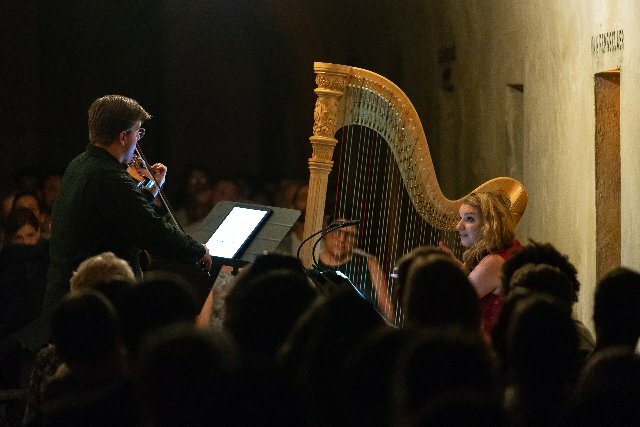 Glistening notes from the harp and rollicking rhythms transport in the Catacombs. The conversation as we exit this intriguing candlelit interior is about surprise and delight and the expressed hope to attend another classical concert soon.